What's the manufacturing steps of aluminum slug for tubes? The manufacture of aluminum tubes starts with what is called an aluminum slugor blank. It is fed into a set of tools in the die which then extrude it. This extrusion press then roughly forms a completed tube form. The next step is to trim the tube to the specified length on both the top and bottom ends. At this point, the tube is threaded which enables us to screw on the cap. During extrusion, aluminum becomes work hardened so during the next step, it is passed through a process which makes the metal malleable. This is done at about 460 degrees centigrade. 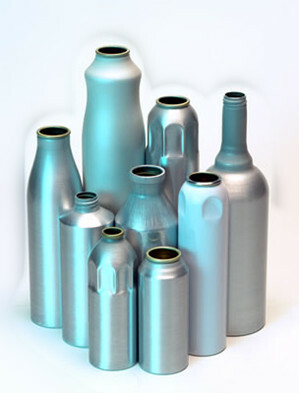 The next step, which is used primarily in the pharmaceutical industry, is the spray application of an internal lining. This acts as barrier protection for metal sensitive products between the exposed aluminum and the pharmaceutical, or other product, to be packaged. If the tube is not internally coated, it will bypass the internal lining step and go to the next step which is the coater rolling of a base coat onto the tube. This coat prepares the tube for the application of offset printing. The base coat is then cured and brought back to a printing machine which puts on the customer’s specified colors and copy. You can see all these tubes detailed for the different customers who require different types of decoration. Tubes for some products require a fold sealant that acts as a barrier to prevent product seepage from the fold end of the tube. The final step in the production of aluminum tubes is the capping operation. And, again, customers generally dictate the types of styles and caps that they like. Primarily, four different materials — polypropylene, and high, medium, and low density polyethylene — are used as cap material. The tubes are then checked, packed in boxes, inspected and loaded either into cartons or on skids for final shipment to the customer. RE: What's the manufacturing steps of aluminum slug for tubes? The production process of an aluminium collapsible tube is a sequence of technological operations which are very different one from another. It is a continuous process and completely automatic: from the loading of the aluminium slugs in the press to the packaging device where the tubes are placed in the boxes. There is no need to handle the tubes manually since they are transported through a series of machines, with automatic passage of the semi-finished product between one machine and the next. The process begins with the loading of the annealed aluminium slugs, from the tumbling department, into the feeder of the press; these slugs, through an elevator and a selector, are automatically transported to the horizontal press where they undergo cold impact extrusion. The slug is then compressed between the tip and the matrix, with so much pressure that it generates a plastic deformation of the aluminium. SFirst the shoulder and mouth of the tube are created while the excess aluminium slides along the circumferential part between the matrix and the tip, forming the tube body. Such a rapid sliding of the material, gives the semi-finished product a tube form, in one blow and an increase in temperature of the same to about 200° C. The semi-finished product is then transported from the press to the tube trimming and thread rolling machine. In this second machine, the semi-finished product is threaded and cut to the desired length. At the end of this operation, the tube dimension is finished. The shoulder of the tube is polished thanks to a rotating brush that makes it perfectly smooth and shiny. La Metallurgica also has automatic systems for eliminating any shavings from the extrusion phase. All of the waste and production scraps are extracted mechanically and aspired by a centralised system for waste collection. All of the aluminium scraps are 100% recyclable. These initial operations of the aluminium tube-forming process are mainly mechanical operations and qualitatively define the dimensional characteristics of the finished tube. Continuing down the line on analysing the production process, the discharge conveyor of the trimming and threading machine places the semi-finished product on a small accumulator which connects the machines performing the mechanical process as described above with the subsequent annealing process where the tube becomes collapsible at temperatures above 400 ° C. The material of the semi-finished product, in fact, after the extrusion operation and the plastic deformation as described previously, recrystallizes and hardens, therefore it is necessary to reach very high annealing temperatures to give pliability back to the tube. The tube is now ready to pass into the internal coating machine which guarantees a protective interior so that it can be filled with practically any type of product. The coating process applies the protective layer using pistols that contemporaneously rotate and shift. The tube is polymerized at a temperature which varies according to the type of coating used, approximately around 300° C.
Both these operations which have just been described, are extremely important. In fact, they determine the resistance of the tube to aggressive agents and its capacity to keep the organoleptic properties of the product it contains, unaltered. The next step is another accumulator which transfers the tube to the printing machine, acting as the driving force in case there is a production line stoppage. The first machine in the printing process is the coater machine which applies, by contact, a layer of external enamel on the surface of the tube. The end of the line has more than one machine: accumulator, leak control, capping machine, latexing machine and packing device. The Leak Control machine is present on all the La Metallurgica lines and it confirms the 100% perfect seal of the tube. This machine has a very advanced transportation system that moves the tubes at variable speeds, stopping the tubes at the work station. At the work station, a sophisticated system is able to verify any loss of pressure, any cuts or holes on the entire tube surface and on the membrane by inserting controlled air into the tube at a stabilised pressure and eliminating the defective ones. The capping machine screws the caps on the tube and if necessary applies a plastic insert. For particular needs, other applications are available on the same machine, such as a guarantee seal or quality control seal. The latexing machine applies a ring of latex on the mouth of the tube, as a further seal guarantee once it is filled and closed. The latex application is carried out on two tubes simultaneously through two centrifuge units. After the latex applications, the tube is moved by the transporter in front of the box it will be packed in. The packing device has a sensor which counts the tubes that pass, controls their introduction into the box, row by row, until the box is completely filled. The tubes, automatically pushed inside the boxes with pushers, are then ready for qualitative control and placement in the warehouse, ready for delivery once the boxes are piled onto the pellets and the pellets are wrapped with extensible plastic film.